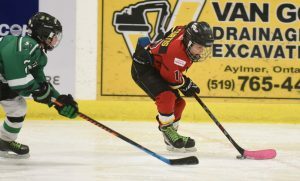 Aylmer Minor Hockey Novice Rep player Ashton Curtis rushed the puck toward the Lucan net during game 2 of an Ontario Minor Hockey Association championship series at East Elgin Community Complex, Thursday night, March 22. Aylmer was down two games in the series, with 1-4 and, in this game, 2-4 losses, but on Saturday, March 24, in Game 3 in Lucan, posted a 5-1 win. Game 4 will be at East Elgin Community Complex Wednesday, March 28, at 6 p.m.